I do. From scratch, for no other reason than a simple craving for a sausage, egg, and cheese sandwich. And why do I have an urge to call this sandwich a ‘Mc’ something or other? McMuffin is just so darn catchy and engrained in our minds. I have lived with the Ronald ‘Mc-ing’ everything from chicken nuggets to said morning breakfast sandwich. And now McBites…what?!? It is true that this craving could have been fixed with a short 10 minute drive down to the nearest McDonalds. A swing through the drive-thru and KA-BAM, craving fixed. Oh and I could have ordered a coffee, made for me but not by me. I love me some coffee! I, however, try with all my might not to eat fast food. I try my hardest not to eat food ordered and picked-up through a drive-thru window. I try not to eat food that in the end is probably going to kill us. Let’s be real here right? I try and I am very successful at this avoidance, however I still have cravings for such foods (I’m only human!). So, therefore I find myself, in my kitchen re-creating. 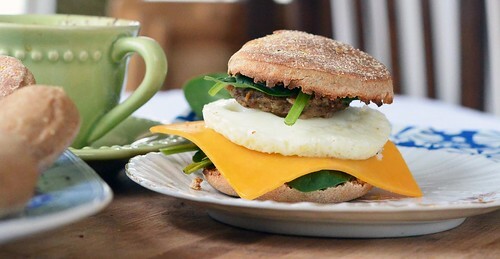 The easiest and most simple item to recreate is their morning sandwiches. A normal person would just pick up a bag of english muffins and be on their merry way. But not me. No. I see a bag of english muffins in aisle 9 and I think, why can’t I just make them at home? It’d be healthier, cheaper, and way more fun. So, that is what I did. I had an afternoon free and a simple craving for a breakfast sandwich. 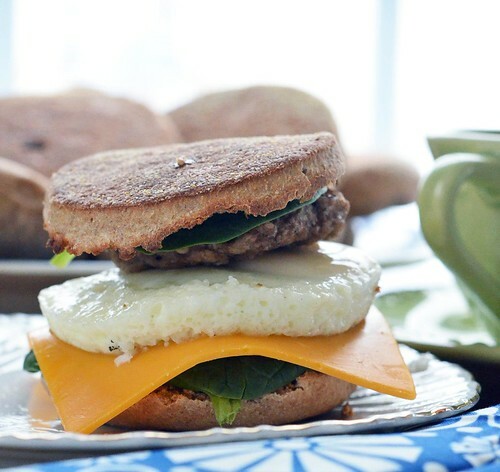 So I did what any crazy person would do….I started off my free afternoon making english muffins and by late afternoon I was munching away on one hell of a breakfast sandwich. Oh heavens. My english muffins don’t have deep nooks and crannies like their store bought counterparts, but there are tiny nooks and crannies and those totally count. Plus, if you open up the muffin with a fork, then the nooks and crannies show up more willingly. They have a crisp exterior and a chewy center. And with the whole wheat flour, they have a lovely nutty flavor. HOwever, feel free to use all-purpose flour if you do not have whole wheat on hand. It will work just fine! I am going to toss the remaining muffins in the freezer and when a craving strikes (because it will and probably sooner than later) for a breakfast sandwich or toast and jam, then I have a quick fix, quicker than any drive-thru, plus it doesn’t require me to leave my house. Bonus! P.S. Don’t forget the salt…I totally forgot the salt. Fact. Sprinkle yeast over warm milk and whisk to dissolve. In a large mixing bowl, combine 2 Cups flour, sugar, egg, butter, and milk/yeast combo. Mix ( I used paddle attachment, you can use beaters as well) until combined. Let rest for about 5 minutes. Switch to a bread hook, and slowly add flour (1/2 cup by 1/2 cup) and salt!, continue to mix until the dough forms into a ball and continue to mix for an additional 3 minutes or so. 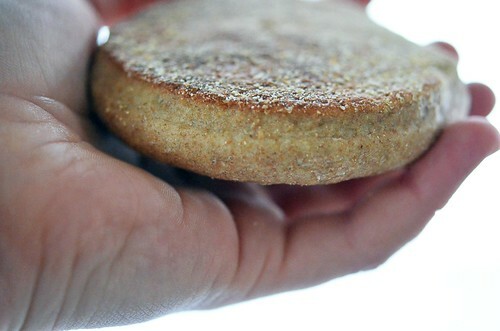 Turn dough out onto a lightly floured surface – it will be sticky. Continue to knead the dough until a soft and smooth dough ball forms. Place dough into a lightly greased bowl and cover with a dish towel and place in a warm spot( oven with just the light turned on) for about 1 hour – about double in size. Dust a clean surface with cornmeal and turn the risen dough out. Roll the dough out to about 1/2 inch thickness. Using a biscuit cutter (about 3 inches in diameter) cut out muffins. Place muffins onto a cookie sheet and cover with a damp towel and let rest for about 20 minutes. Heat a skillet (cast iron is what I used) over low heat and sprinkle bottom of pan with cornmeal. (if the cornmeal begins to smoke, then the skillet is too warm). Do not grease the pan – the muffins will not stick. Promise. 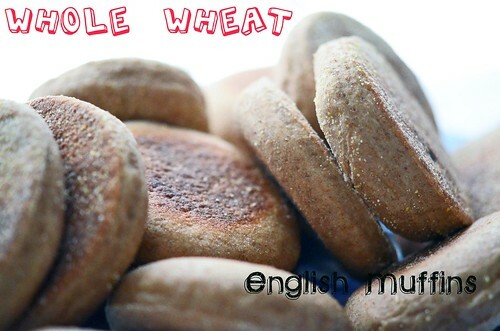 Place muffins, cornmeal side down, into skillet and cook for about 7 minutes or until golden brown. Flip and cook for an additional 5-7 minutes or until golden brown on the other side. If the muffins are browning too fast then decrease the heat. Once golden brown on each side, remove from skillet and let cool on a wire rack. Once cool, split muffins with a fork (for the nooks and crannies) and toast. Grab all your sandwich fixin’s. 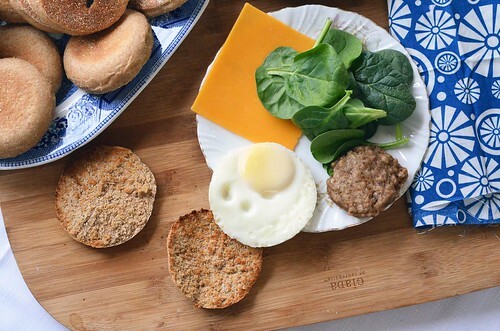 I thoroughly enjoy sharp cheddar cheese, spinach, turkey sausage, and an egg (prepared any which way). Piled high and served with a fresh cup of coffee! I aslo like to make toasted pb (or almond butter) and jam (or apple butter) mini sandwiches…oh so good!